​If you are feeling a bit despondent and negative about your body as we head into this cold snap, I am sure you are not alone. It is the time of year to be bundled up in layers whilst simultaneously searching for comfort food to survive through the winter days. If you relate to this and you would like to feel better about your body image today, then read on. We have 60,000 plus thoughts per day and many of these are repetitive. Just imagine the powerful ripple effect of a sabotaging critical thought that is whirring through your brain every hour. Start to notice, what your body image mantra actually sounds like. ‘You’re so fat; you’re ugly; you have no self-control; you’ll never lose weight; you’re tummy is flabby’. I have heard all these thoughts before from clients and from friends in daily conversation. So be aware of your thinking and start to question it. What might be a more supportive way to speak to yourself? Counsellors often work with people who profess to feeling fat and hateful of their bodies on a daily basis. These comprise people of all shapes, weights and sizes. The ‘fat feeling’ can be a powerful conviction from the thinnest girl in the room. But what does this mean though? If you feel that something is true; even if you feel it with extreme certainty, it does not and cannot mean it is always the truth. So start to distance yourself and question your thoughts. Maybe, just maybe you are being a little bit (or possibly very) hard on yourself. When you look in the mirror, how do you observe your body? Do you immediately zoom in on your perceived imperfections? Or do you view your body as a whole and notice the parts you can be more accepting of? How you observe your body is very significant and will affect your mood and thinking. Sometimes you may check your tummy size or leg width numerous times a day, to almost confirm your absolute worst fears. Often you might even feel that you can immediately see a change in your least favourite body part after you have eaten. Is this really possible? Really? Be aware of how you are viewing your body and then thinking about it. Notice the body parts you can be more accepting of and pay them compliments. Another research study recently showed the link between an increase in the prevalence of Anorexia Nervosa and the exposure that people have to ‘selfies’. The Internet is crawling with pictures of thin or super-fit bodies. The body has become a construct to be perfected and admired. Photoshop and airbrushing are the norm. No wonder that looking at this stuff regularly affects self-esteem massively and erodes confidence. Reduce your viewing time of these types of images and you will feel better. Do you walk into a room and immediately compare yourself with other people? If you are doing this, you are in a no-win situation. Even if you are a 6ft supermodel, there is always possibly going to be someone younger, prettier and thinner coming along. Comparisons are fruitless. They stop you being the best version of yourself. They keep you locked in a cage of inadequacy that is hard to break out of. Notice if you are doing this regularly; make efforts to curb it. If you walk down your local high-street tomorrow and have a genuine stare at the bodies around you, I promise you, very few, if at all, will have your definition of a perfect body. Sometimes we are so bombarded by the media that we forget what real bodies actually look like. Take a thorough look; I bet you that you might notice your body is actually okay. 7. Is attractiveness just about thin? When you are doing your high-street perusal, look about and notice who looks good? Who looks attractive and vibrant? Is it really all about body shape? What other things make someone look appealing and what can you learn from this? Make-up, clothes, posture, confidence – they all play a vital role. It is easy to spend much time evaluating and judging the outer body whilst the inner body might get less respect and attention. Remember to value your body for what it can do for you. Take care of your body from the inside out. Nourish it with wholesome healthy foods, moisturise, have luxurious baths, do some exercise, breathe and be kind to your body. One day you might well long for the body you have today. Appreciate it now. Is your drive for weight loss or a better shape, an attempt to boost self-esteem? There is no doubt that being healthy and taking care of your body is going to enhance self-worth. However, when it is taken to an extreme and you only allow yourself to feel good when a specific weight or shape is achieved, then you are in dangerous waters. How are you feeling deep inside? Are you trying to plaster over this feeling of possible inadequacy by directing your energy into changing your body? Okay your tummy might not be as you would like it. However, for most people reading this, your body is likely to be healthy; full of movement and agility and strength. We all forget what a fantastic quality of life we have in this country compared to many other parts of the world. 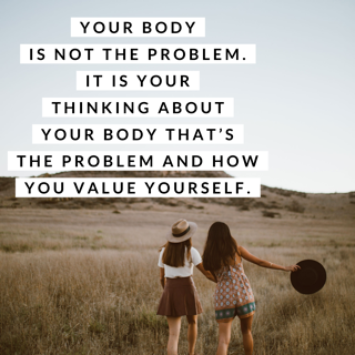 Spending time beating yourself up about your body is a waste of time and stops you fulfilling your true potential and making a real difference in the world. When you look back on your life (at hopefully ninety plus years old! ); you are not going to worry about the size of your thigh gap. Other things will feature as far more important. Have a go at taking on my top ten tips and here’s to feeling good about your body image into 2019!